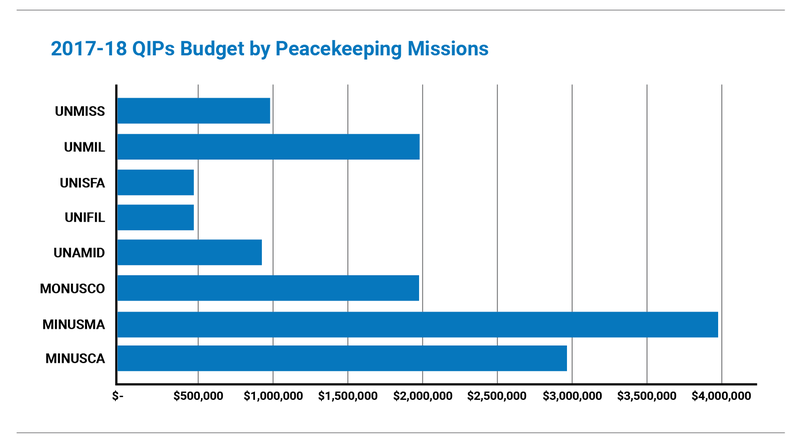 UN Peacekeeping Quick Impact Projects are designed to build confidence in the mission, its mandate and the peace process. Quick Impact Projects (QIPs) are small-scale, low cost projects, funded by our missions, that are planned and implemented within a short timeframe. QIPs aim to build confidence in the mission, the mandate or the peace process. QIPs respond to the needs expressed by local communities. As a result, they cover a wide range of programmatic activities from refurbishing a school to providing women with safe water access points. QIPs are mainly implemented through local actors including local authorities, non-governmental and grassroots organisations. As such, the implementation of QIPs projects help build their management capacities while broadening the mission’s outreach at the local level. Building confidence in the mission and its mandate. The UN Mission in South Sudan (UNMISS) used QIPs to create a weapons-free zone on the perimeter of the UN-House Protection of Civilians (PoC) site in Juba. The project included the construction of a solar-powered water system and the clearance of vegetation surrounding three communities around UN-House in Juba. Concrete activities like these help build public confidence in the ability of the mission to fulfil its mandate, in the case of UNMISS focused primarily on protection of civilians. The UN Mission in Mali (MINUSMA) is working with a local organization specialized in providing adult literacy education in Gao, northern Mali. MINUSMA help refurbish 3 classrooms where more than a hundred men and women attend classes in their local languages. Literacy classes help them better access and understand first-hand information on the peace process. It also empowers them to voice their concerns and hope for the future of their community and country.